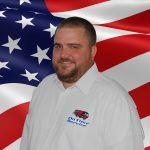 I’m Johnathan and I’m a state certified master plumber and gas fitter with 18 years’ experience. My wife Sarah and I have 5 awesome kids. So I don’t have a lot of free time but when I do I enjoy hunting and fishing.